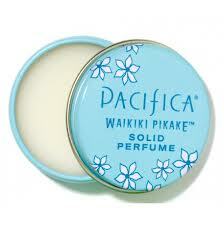 I love this scent, it's like a trip to Hawaii in a bottle! It's not too flowery or over powering and just smells fresh. Pacificaperfume.com carries many sample size scents for just $2 each tin you can try the different scents out and decide which work best for you.